1. 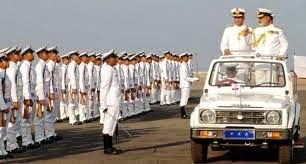 At an impressive Passing Out Parade (POP) held at the Indian Naval Academy (INA), Ezhimala here today, 399 cadets of the Indian Navy and the Indian Coast Guard passed through the portals of the INA, on successful completion of their training. This POP marked the commissioning of the cadets of the second B Tech graduate course (85th Indian Naval Academy Course) into the Indian Navy here today morning. 2. The passing-out cadets belonged to the four passing-out courses of the Autumn Term 2013, viz., the 85th Indian Naval Academy Course (INAC), the 85th Integrated Cadet Course (ICC), the 16th Naval Orientation (Extended) Course and the 17th Naval Orientation (Regular) Course. Also graduating and marching shoulder to shoulder with their male counterparts were 28 female cadets from the Indian Navy and the Indian Coast Guard. 3. The parade was reviewed by the Chief of the Naval Staff, Admiral DK Joshi, PVSM, AVSM, YSM, NM, VSM, ADC. After the ceremonial review, Admiral Joshi awarded medals to several meritorious cadets. The Flag Officer Commanding-in-Chief, Southern Naval Command, Vice Admiral Satish Soni, PVSM, AVSM, NM and, the Commandant, INA, Vice Admiral Pradeep Chauhan, AVSM & Bar, VSM, were also present at this momentous occasion. All the Passing-Out cadets took an Oath of Allegiance to the Constitution of India, which was administered by the Deputy Commandant and Chief Instructor, INA, Rear Admiral G V Ravindran. The Passing-Out Parade was witnessed by the proud parents and guardians of the successful cadets, as well as by a large number of dignitaries, including several Defence and Naval Attaches of friendly foreign countries. 4. The ‘Presidents Gold Medal’, for the cadet adjudged first in the overall order-of-merit of the INAC course was awarded to Squadron Cadet Captain Kiran T Anil, ‘Chief of the Naval Staff Gold Medal’ for the cadet adjudged first in overall order-of-merit for the Naval Orientation (Extended) Course was awarded to probationary Sub Lieutenant Avijit Mishra. Probationary Sub Lieutenant Kritika Sharma was awarded the ‘Chief of the Naval Staff Gold Medal’ for the cadet adjudged first in overall order-of-merit for the Naval Orientation (Regular) Course and also the ‘Flag Officer Commanding-in-Chief (South) Gold Medal’ for being adjudged the best female cadet of the course. 5. The glittering ceremony culminated with the successful cadets forming up in two columns, and marching, with their gleaming swords held in salute, past the Academy’s Saluting Dias (known as the Quarterdeck), in Slow March, to the traditional notes of ‘Auld Lang Syne’, the poignant farewell tune played by all Armed Forces of the world when bidding adieu to colleagues and comrades. Naval and Coast Guard Donier aircraft flew past in perfect synchronization with the Passing-Out Drill. 6. On completion of the parade, the ceremony of ‘Shipping-of-Stripes’ was conducted. The proud parents/guardians of the passing out cadets shipped the Naval (or Coast Guard) epaulettes, popularly known as ‘Stripes’ on the shoulders of their children/wards, thus symbolizing their transformation from ‘cadets’ into full fledged Naval or Coast Guard Officers and leaders. The Chief Guest and other dignitaries present congratulated the trainees on their successful completion of the rigorous course. On completion of the training at the Indian Naval Academy, the officers will proceed to various Naval and Coast Guard ships/establishments, to consolidate their training in specific fields.